I love doing crafts. It’s something I’ve enjoyed for years but I don’t always make the time to do crafts. This weekend I took some time to create a DIY Fall wreath for our door. 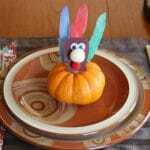 It was easy, took only 30 minutes and received many compliments from our Thanksgiving guests. I created this wreath after an example I saw last Spring at a well known large store – their retailed for $39.99 – my version cost under $10! Heat up glue gun. Divide wreath in three sections and mark with a light pencil. Choose one yarn to begin with and attach the end with some glue. Wrap yarn around the wreath until you cover 1/3 of the wreath. 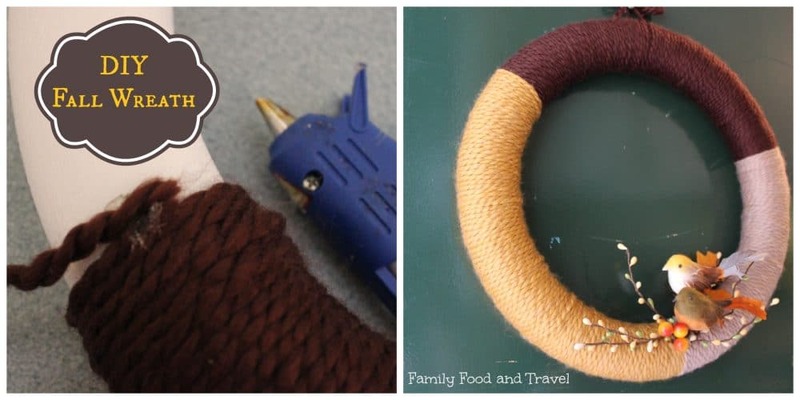 Attach end of yarn with glue. Repeat with the next two colours and repeat until wreath is wrapped with all three colours. Cut picks to desired length and attach in the bottom right hand corner of the wreath. Tie piece of yarn at the top to act as a hanger. I love it! 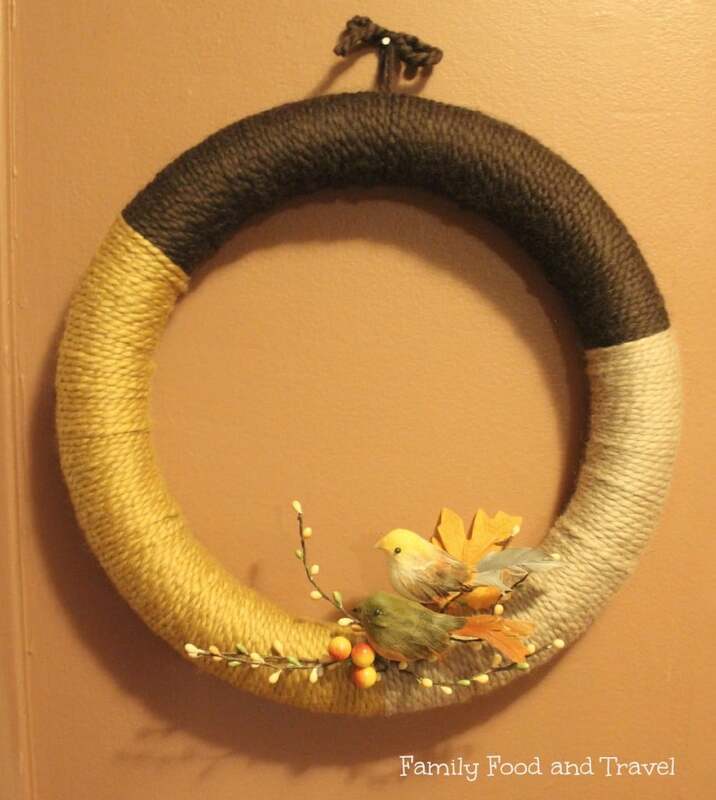 I have it on my Fall Bucket list to make a new wreath. and the simpler, the better. Thanks for sharing. Love the little birds on it! You made that look so easy! I love the way it turned out. 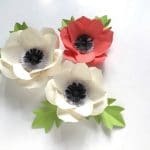 I’ve paid big bucks for wreaths at craft fairs – who knew it was so easy to just make them myself? Robin (Masshole Mommy) recently posted..The Big Day! What a very cute and simple wreath. So many times Less is More and you have proven that here. You did a great job getting that yarn to look so straight. If I did it… it would look like a mess. This is a wreath I would love to put up on my apartment door (where my cat could not see it! )-it is so pretty and different. 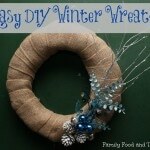 Love this wreath, it is gorgeous and looks easy to do. I am just going to have to try it out. That is one of my favorite Fall wreaths I’ve seen yet this year! So cute and very simple! Great wreath! 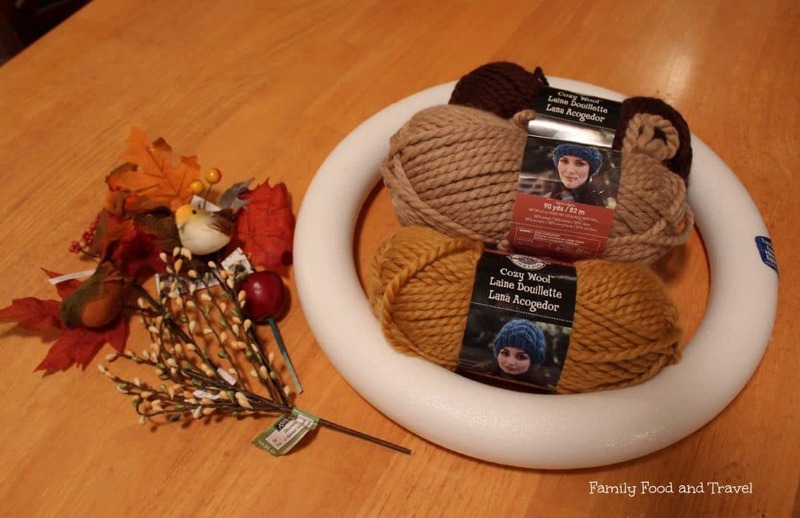 I need to make a few wreaths using yarn. I have a stash of it that will never be used. On my to-do list this fall! I love how simple t\his wreath is. This wreath is so pretty and looks so easy to make. I was just telling my husband that the front of our house looks plain and we need to decorate it a little bit to help get into the holiday spirit. That is beautiful in its simplicity. I really like it a lot and you could make variations of it for other holidays too. Liz @ A Nut in a Nutshell recently posted..Discover Halloween! Nice, neat and welcoming too. You did a great job! I’m looking for a fall wreath and making one would be fun-this looks easy to do too! So exciting! I’ve been wondering how to make one of these yard wreaths. Love the fall colors. So cute! Thanks! This is really quite simple but classy. I love fall decorations. It is my favorite time of the year to decorate. Even more so than Christmas. I love this idea! You did a great job. 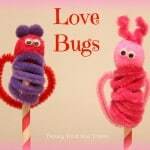 I can see how this idea could be used for different holiday by doing different yarn colours and decorations. oh that does look quick and easy, great job! Jennifer recently posted..How to create a Surfer Boy Bedroom for your lil’ surfer dude! Beautiful and simple! I will try this!